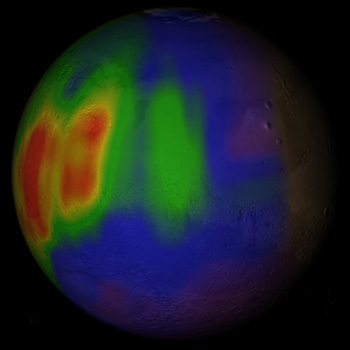 A color-coded map of the release of methane in the northern summer on Mars. Credit: Mumma, et al., NASA. 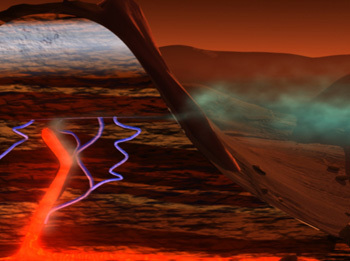 Artist's concept showing one possibility for how methane might be formed on Mars geologically. Subsurface water, carbon dioxide, and the planet's internal heat combine to release methane that had been trapped in the ice. Credit: NASA/Susan Twardy. Methane gas has been detected in the atmosphere of Mars in concentrations of up to several tens of parts per billion. Because methane is unstable in the martian atmosphere, with a lifetime of just a few hundred years, some process on or below the surface must be continuously replacing it. Scientists do not yet know if this process is geological or biological. The methane is not given off uniformly over the whole planet. Instead it emerges as plumes over certain areas that show evidence of ancient ground ice or flowing water (see map). For example, plumes were observed to appear in summer in the northern hemisphere over regions such as east of Arabia Terra, the Nili Fossae region, and the south-east quadrant of Syrtis Major, an ancient volcano 1,200 kilometers (about 745 miles) across. Methane was originally detected on Mars by three separate groups of researchers: a team operating the Fourier Transform Spectrometer aboard the European Mars Express orbiter, a team from NASA Goddard Space Flight Center using several large telescopes, and a team led by Vladimir Krasnopolsky using the Canada-France-Hawaii Telescope. All three pointed to a methane abundance of about 10 parts per billion averaged over the whole planet. The NASA group was the first to observe variations in the methane concentrations. In mid-March 2004, the European Space Agency announced that a team led by Vittorio Formisano of the Institute of Physics and Interplanetary Science in Rome had detected methane in the martian atmosphere using the PFS aboard Mars Express. This instrument maps the infrared radiation from the martian environment in wavelengths from 1.2 to 50 microns. The researchers averaged data from nearly 1700 spectral samples taken by Mars Express in January and February 2004 and found a line at exactly the point (3.3 microns) where one would be if methane were present in the martian atmosphere. "We have been able to detect a very small quantity of methane," said Formisano. "It's around 10.5 parts per billion." The result confirmed data collected by the NASA team led by Michael Mumma, reported at the annual meeting of Division for Planetary Sciences in September 2003. Mumma's group detected one spectral line for methane on Mars using highly sensitive infrared spectrometers attached to the Gemini South telescope on Cerro Pachon, Chile, and the Keck-II telescope on Mauna Kea, Hawaii. According to Mumma, the resolution of the ground-based telescopes used by his group was 50 times greater than instruments on Mars Express. Both these results were supported by yet another group. Vladimir Krasnopolsky of the Catholic University of America in Washington DC and his colleagues had also found a single spectral line for methane on Mars using the Canada-France-Hawaii telescope. Still, these early results were considered controversial because the spacecraft measurements did not include all of the spectroscopic signatures of methane, and ground-based observations were made problematic by interference from methane and other trace gases in Earth's atmosphere. In January 2009, a paper published in the journal Science by the NASA group led by Mumma dispelled these concerns and provided definitive evidence of martian methane. The observations further showed that the methane averages 33 parts per billion in the northern hemisphere in summer but essentially disappears afterward. About 0.6 kilogram of methane emerge each second in the summer – comparable, according to Mumma, to the emissions from a natural oil seep near Santa Barbara, California. Perhaps, he said, the martian methane is continually produced beneath the surface but only released when summer warming breaks an icy seal on the surface. Methane in the martian atmosphere is not stable and cannot last more than a few hundred years, because it reacts with hydroxyl ions in the presence of sunlight, forming water and carbon dioxide. On Earth much of the atmospheric methane is produced by methanogenic bacteria (see methanogens) that digest organic matter in areas such as wetlands and waste landfills, and even in the guts of some animals and produce methane as a by-product. There is also methane beneath the Earth's crust that is left over from the formation of hydrocarbons. This old methane is routinely spewed out of mud volcanoes, vents, and bubbling pools, or it slowly seeps out of fissures in Earth's crust. Methane can also be formed during volcanic eruptions and in geothermal reservoirs. It is still not known if the methane on Mars is due to life or not. On Earth, the conversion of iron oxide (rust) into the serpentine group of minerals creates methane, and on Mars this process could proceed using water, carbon dioxide, and the planet's internal heat. Although we don't have evidence on Mars of active volcanoes today, ancient methane trapped in ice "cages" called clathrates might now be released (see illustration). If microscopic martian life is producing the methane, it likely resides far below the surface, where it's still warm enough for liquid water to exist. Liquid water, as well as energy sources and a supply of carbon, are necessary for all known forms of life. Mumma pointed to a possible terrestrial analogue for martian microbes: "On Earth, microorganisms thrive 2 to 3 kilometers (about 1.2 to 1.9 miles) beneath the Witwatersrand basin of South Africa, where natural radioactivity splits water molecules into molecular hydrogen and oxygen. The organisms use the hydrogen for energy. It might be possible for similar organisms to survive for billions of years below the permafrost layer on Mars, where water is liquid, radiation supplies energy, and carbon dioxide provides carbon." Microbes that produced methane from hydrogen and carbon dioxide are believed to have been among the earliest forms of life on Earth. If life ever existed on Mars, it's reasonable to suppose that its metabolism might have involved making methane from martian atmospheric carbon dioxide. Future space missions, such as the Mars Science Laboratory will be needed to determine the origin of the martian methane. One way to tell if life is the source of the gas is by measuring isotope ratios. Isotopes are heavier versions of an element; for example, deuterium is a heavier version of hydrogen. In molecules that contain hydrogen, like water and methane, the rare deuterium occasionally replaces a hydrogen atom. Since life prefers to use the lighter isotopes, if the methane has less deuterium than the water released with it on Mars, it will be a sign that the methane is biologically produced.